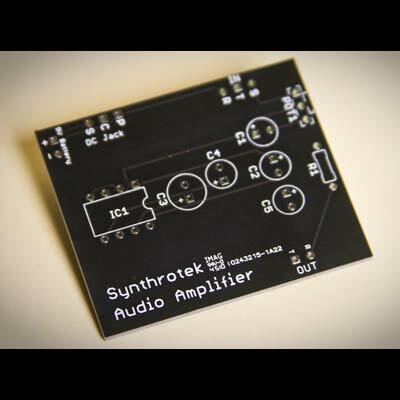 Features: The Synthrotek Audio Amplifier is another super easy kit to build with a host of application. This kit is based upon the LM386 Op Amp IC. Great as a pre-amp for your Atari Punk Console , allowing the APC to be used as a pedal stop box. 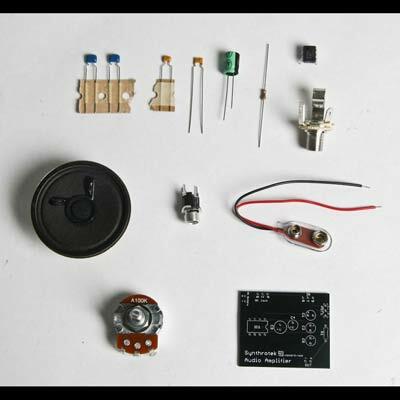 This kit can also make a great lofi amplifier if connected to a speaker; take your live music on the street corner and use this 9V battery operated (or 9V wall-wart) to impress passers by. Other uses include a heaphone amp. Kit includes a small 8 ohm speaker, however you can add a jack to the speaker output and use this device in may other ways. The PCB has a detailed screen print that shows you exactly where and how to place even polarized components. Enjoy!